Saga fever is hitting the club hard and I was one of the first to jump on CA$H's bandwagon when he returned from Cold Wars. I made an order through a local store and waited patiently for my goodies to arrive. Then I started to get less patient and pester the store. I prefer buying stuff off the shelf precisely because I don't do well when waiting for a mail order to arrive. Reading the other posts about people painting their miniatures and playing games did not help me to remain calm. By the time my miniatures arrived I was positively frothing to get started. I felt really behind the pace and wanted to get the miniatures painted as quickly as possible. Based on my success setting strict deadlines for my Guild Ball project I decided to do the same with Saga. I was able to paint two 6-player teams for Guild Ball in 3 months at an average of 1 week per model. For Saga I knew I had to turn things up, all the way to 10. Darn, I wish I had painted 11 miniatures a week so I could have made a This is Spinal Tap reference. Going from 1 miniature a week to 10 was not an easy task. I've painted large batches of models before but usually only 4-5 at a time. Once, when I was actively painting, I managed 9 figure batches. That was my high water mark and every other time I attempted that amount I regretted it. 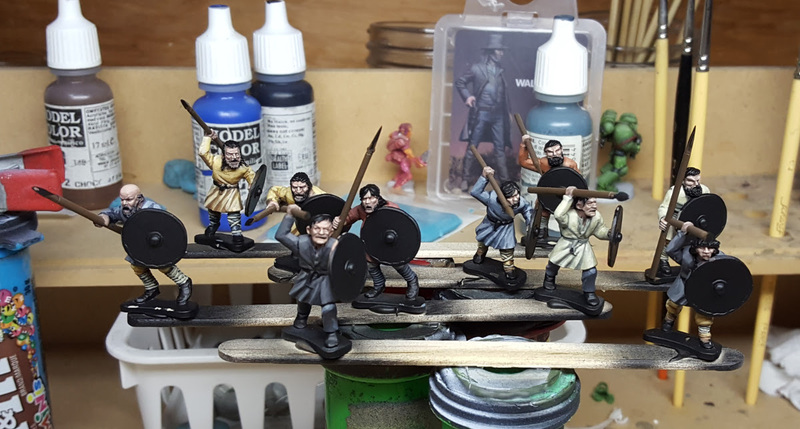 Still, I have been actively painting and I really wanted to get my warband to the table as quickly as possible so 10 it is. 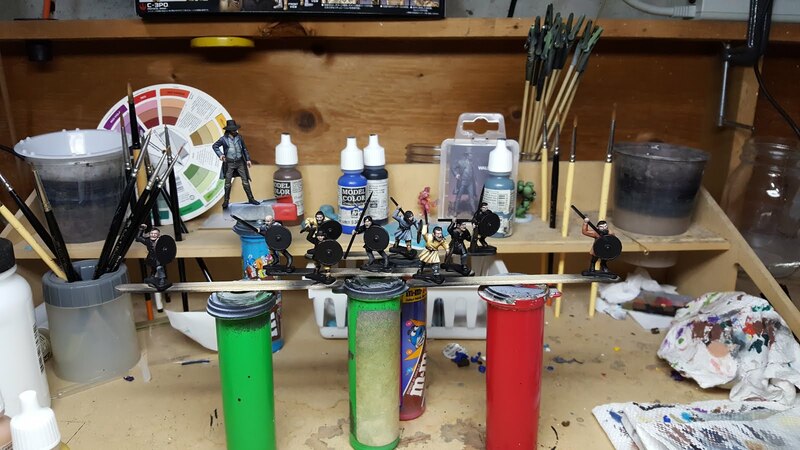 Hard to see because they are primed black there was 10 plastic warriors glued to craft sticks glued to 4 home-made painting grips. 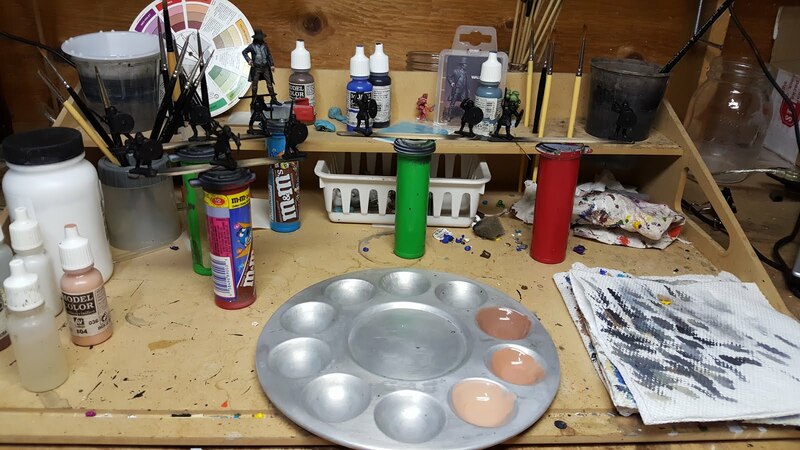 As I assembled the miniatures as quickly as I could I had to make a decision whether I was going to paint the shields separately and attach them at the end. I think I made the correct choice of attaching them during assembly. While it will be tricky to reach a few places it will save me time, plus I won't have to worry about accidentally highlighting the wrong edge of the shield. In the picture you can see how I handled my highlighting and shading. I made three mixes, shadow, midtone and highlight. Starting from black I applied a coat of my shadow. Then I applied my midtone over top, leaving the shadow in the lower portions of the miniature where shadow would fall. Finally I added my highlight to just the upwards facing areas. I wasn't worried about perfect coverage, I just worked quickly. Since I was building up with a darker colour over the black I knew I would be able to get away with less coats for coverage and a little blotchyness, as opposed to visible brush strokes, would appear to be carefully applied "weathering". Only rarely did I apply a second coat. Occassionally I would find the transition from midtone to highlight to be too stark. I'd quickly make an intermediate mix of the two colours and paint it at the borders. I think I only ended up doing this for a couple of colours. One night of painting later. Many years ago I worked out a system for painting a non-uniform unit of miniatures while painting 10mm Orcs. I would pick a colour and randomly apply it to either the tops, pants or neither of each miniature. I would make multiple passes of different colours, doing the same. When I'm done I have a pseudo-random and motley looking crew while still using an assembly-line painting technique. This time I noticed that the first few colours I pick will dominate the group as I tend to use it on 1/4th of the miniatures in each pass. After a few passes some models have both top and pants painted at that 1/4th shrinks. The skin, clothing and wood are completed. Should be the home stretch, right? After my second evening of painting I had painted the skin, cloth and wood on all the miniatures. 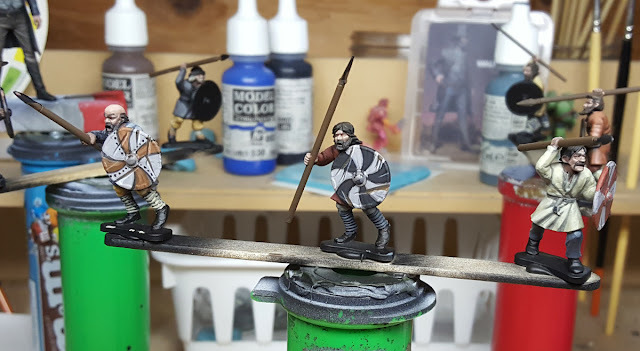 One of my speed painting tricks when dealing with non-uniform units is to only worry about the large areas looking difference. At this stage having all the wood painted exactly the same colour isn't very noticeable. I will do the same for the leather. Boots, belts and pouches will all be painted the same shade. I was feeling very good about myself at this stage and was evening thinking I might be able to handle two batches of 10 a week. It was a heady few minutes of delirium until I remember that I still had all the shields to paint. I hadn't ordered shield transfers like an intelligent person so painting the shields was going to take at least as long as everything else. By Saturday I was slowing down. I'd missed a day of painting on Friday to attend an epic whiskey tasting event and was still feeling the burn. I used a technique similar to the clothes when painting to shields to keep them from looking too uniform. For each painting grip, I had four with either two or three miniatures attached to each, I picked a background colour as the base and then painted the design using a different colour. I had also painted the hair at this stage. Sunday is laundry day so I get to spend my day in the basement swapping loads of laundry and painting miniatures. My miniatures arrived Tuesday but I wanted Sunday to be the end of my painting week so I pushed hard to complete the rest of the shields and other details. Although adding all the battle damage to the shields increased the time it took to paint them I think the effect is well worth it. The lines draw the eye and distract from any wobbly lines in my freehand design. In order to create the damage I just randomly painted brown lines (the colour I used for all the wood) followed by a black line on top and a nearly white line on the bottom. This creates the illusion of a large gash in the wood. I paint chipped paint the same way. One important, but subtle, touch was a big of spot glazing at the end. Every face received a few spots of red glaze on the nose and either the cheeks or eyes. Those without beards received a couple of glazes of blue-grey for stubble. Finally everyone received random splashes of brown glaze focuses around the legs, bottom of shields, tunic bottoms and armpits. These slight touches of colour make the miniatures look more detailed than they are. Finally, the bases had a 13/64" hole drilled in them and then a 1x5mm neodymium magnet super-glued in place. This is for my storage as I plan to use metal-lined storage containers. I will finish the base with some modeling putty painted brown followed by green flock once I've painted the entire warband. Do not throw javelins at those shields, they took a long time to paint!